The Main St. Community Garden in Clayton will be holding plant sales each Saturday from 9 to 2 from April 6 through May 11. There will also be a bee hive demonstration on April 13 from 10-12. 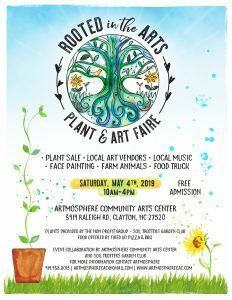 Check out the Rooted in the Arts Plant and Art Faire. There will be a plant sale, art vendors, face painting, farm animals, food truck, dog rescue, working artists on site and more. The event will be held rain or shine, and there is no cost for admission. For more information, email artmospherecac@gmail.com or call 919-938-8015.